Calphalon 8-Quart Pot Just $79.99! Down From $180! PLUS FREE Shipping! You are here: Home / Great Deals / Amazon Deals / Calphalon 8-Quart Pot Just $79.99! Down From $180! PLUS FREE Shipping! Get this Calphalon Stainless Steel 8-Quart Pot with Pasta Insert for only $79.99, down from $180.00 PLUS FREE shipping! The Calphalon Stainless Steel 8-Quart Pot with Pasta Insert includes everything you need to cook pasta, steam vegetables, and prepare lobster and other seafood. Designed for easy cooking, fast cleanup, and maximum performance, this multi-pot and insert set lets you easily boil and steam large amounts of food. Sturdy stainless steel construction surrounds an impact-bonded aluminum base, delivering excellent heat conductivity. The Calphalon Stainless Steel 8-Quart Pot with Pasta Insert is dishwasher safe for easy cleaning, oven and broiler safe! A heavy-gauge aluminum core is sandwiched between two layers of stainless steel by means of high-heat, high-pressure impact bonding for extreme durability. Aluminum core provides superior conductivity and even heating for excellent browning and control of the cooking process. Non-porous stainless steel cooking surface is safe for use with all utensils. 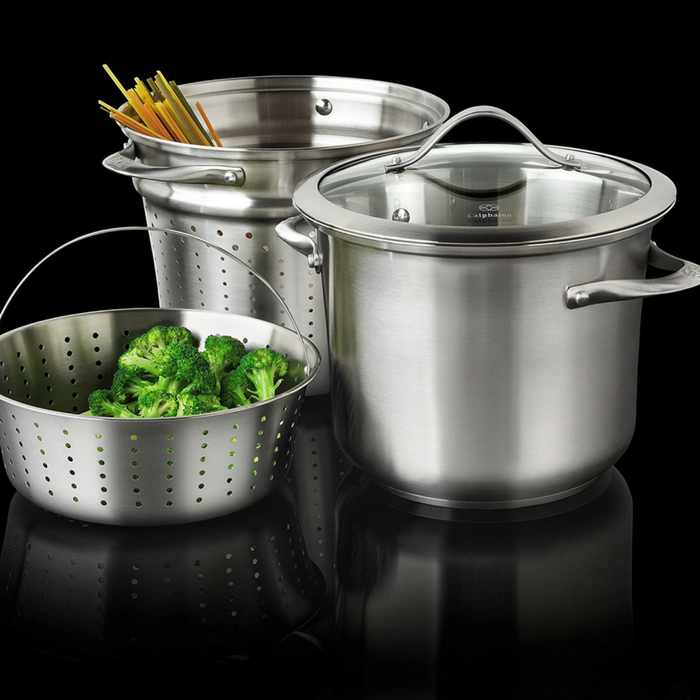 Includes 8-quart stock pot, pasta insert, steamer insert, lid.